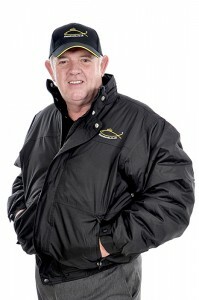 Hi, my name’s Malcolm Scullion and I’m the owner of Bassboots.co.uk. I have been a keen Bass fisherman for over 35 years. I was getting a bit tired of forking out for brand new cheaper waders that didn’t always fit and quite often got torn and could not be repaired, therefore had to be replaced at great expense. On some occasions two or three pairs in one year. Seven years ago I discovered a material so strong and lightweight which was also 100% waterproof so I decided to get some made for myself. I went to a seamstress and had a pair made. Since then I have walked hundreds of miles and sat on and skidded down many barnacle rocks. They have lasted so well and are as waterproof now as they were then. That was seven years ago and I’m still using my original waders. Now I’ve developed a range of strong, made-to-measure waders that can be used in all fishing conditions. When you order your bespoke waders, don’t forget this is a truly personalised order and you can select your own boots/socks, pockets, logo/initials and any other requirements you may have. Take a look around our site and discover the world of Bassboots bespoke waders for yourself….